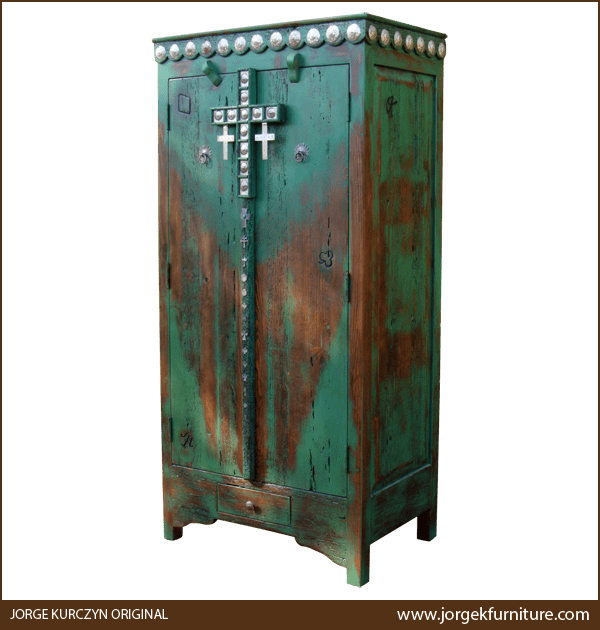 Grace your Western décor with the exquisite, silver finished, hand forged, iron details adorning this handcrafted, Spanish colonial style armoire. 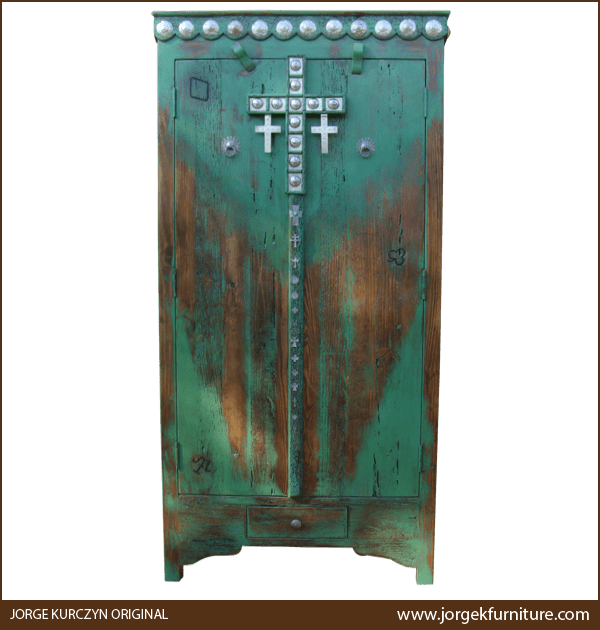 The front of the armoire has two, large, solid wood doors, and centered in the top of the doors is a spectacular, silver finished, Spanish colonial style cross. The cross is embellished with silver finished conchos and with a smaller, silver finished cross on each of its sides. Centered in the upper top of each door is a silver finished concho with a hand forged, iron, pull ring. The design of the two, large doors are divided by hand forged and hand tooled iron rings that run downward from the silver cross to the termination of the doors. The armoire has a classic, straight, top rim, with luminous, silver finished conchos hand tacked to the area below the top rim. The base of the armoire has a practical drawer for storage, with a silver finished, iron, pull knob in its center. The bottom of the base has a staggered, curved design, and each lateral side of the armoire has a rectangular cut panel. The armoire rest on sturdy, short, square cut feet, and it has a beautiful, distressed, turquoise finish. The inside of the armoire has a large space that can be designed with custom shelving and drawers for extra storage. It is made with the best, sustainable, solid wood available, and it is 100% customizable.